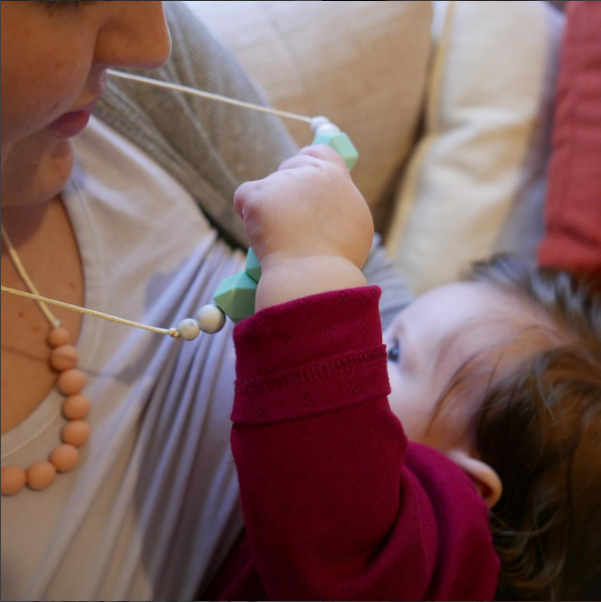 East London Baby Co necklaces have been designed to distract fingers whilst feeding - whether that be bottle feeding or breastfeeding. Some babies pull hair, stick fingers up your nose or even pinch you whilst they're eating! Our necklaces are designed to be the perfect length for most mums for babies from birth to several years old. The different shaped and sized beads add lots of interest for fingers, and all colourways have been tested to ensure they catch baby's eye. All our necklaces are baby and child-proof and the perfect accessory for the busy parent.